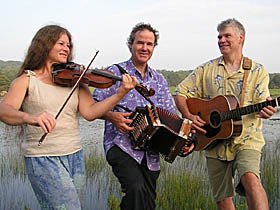 Ti’ Acadie, a lively trio focusing on the Francophone folk music of Louisiana and Atlantic Canada, performs this week’s installment of the 2009 Bates College Midsummer Lakeside Concert Series at 6 p.m. Thursday, July 23, in the Florence Keigwin Amphitheater at the college’s Lake Andrews. In the event of rain, the concert will take place in the Olin Arts Center Concert Hall, adjacent to the amphitheater at 75 Russell St. The 2009 series also presents the collaboration of Bates Dance Festival musicians known as the One World Music Ensemble and Réveillons!, a band known for its modern take on traditional Quebecois music. Lakeside concerts start at 6 p.m. on consecutive Thursdays in July and August. Sponsored by the Harward Center for Community Partnerships at Bates and the Bingham Betterment Fund, the concerts are open to the public at no cost. Picnics are encouraged, as is bringing lawn chairs or blankets. Ti’ Acadie, or “little Acadia” in French, is a Maine-based folk trio whose name refers to the Francophone culture of Nova Scotia and New Brunswick, a culture reflected in the Cajun people of Louisiana. Ti’ Acadie features Pam Weeks on fiddle, mountain dulcimer and vocals, Jim Joseph on button accordion and five-string banjo, and Bill Olson, a singer, guitarist and bassist also known as a contradance caller. The three have made music together since they met in the popular Maine contradance band Scrod Pudding in 1990. In 1996, united by a love of high-energy, highly percussive Cajun music, they formed Ti’ Acadie. Since then, they have toured together, offering not only Cajun music but old-time songs with tight harmonies, Québécois dance tunes and New England contradance music. Ti’ Acadie is fascinated by the link between the Cajun and Acadian peoples, and uses music to explore this connection. This blending of styles makes for an interactive, engaging and undeniably unique concert experience. July 30, One World Music Ensemble: One World Music Ensemble comprises musicians from the Bates Dance Festival. This nationally recognized dance festival brings together an extremely diverse and talented group of musicians. This program promises to be a tapestry of rhythms and melodies from all corners of the globe. The ensemble plays a vast array of world instruments, including accordion, kalimba, bouzouki, marimbas and percussion, making for an incredible collaboration of cultures. Aug. 6, Réveillons! : Aligning themselves with “the current universal . . . longing to ‘return to our roots,’ ” Réveillons! is influenced by the Québécois tradition. The group hails from Montreal and features David Berthiaume on vocals, jaw harp and concertina, Marc Maziade on guitar, tenor banjo and vocals, Richard Forest on fiddle and Jean-Francois Berthiaume as the band’s caller. Réveillons! is French for “Wake up!” Since forming in 1996, Réveillons! has played reels, jigs, French songs and step dances at major festivals in Quebec and cities around the U.S. and Canada.